Downhole geophysical surveys successfully completed! Drill hand Donnie and ICDP specialist Jochem retrieve a downhole data tool after a long day of surveying. Last week, our European collaborators came back to finish the downhole geophysical surveys that could not be completed in February. Although only the first hole on the grounds of the PTA cantonment could be surveyed, the data acquired last week from these surveys is excellent and there were no major problems in getting it. After some processing of the data this summer, a paper using this data and corresponding rock sample petrophysical measurements in the lab will eventually be published. Additional papers are also in the works, including a general overview of the stratigraphy of both holes and a study of secondary minerals in the lower portion of the first hole where we found elevated temperatures. We hope to submit these papers for publication by the end of the year, and that they will spur further interest in researching the geology and hydrology of the two saddle boreholes. The visit by a couple of our collaborators is complete, with mixed results. 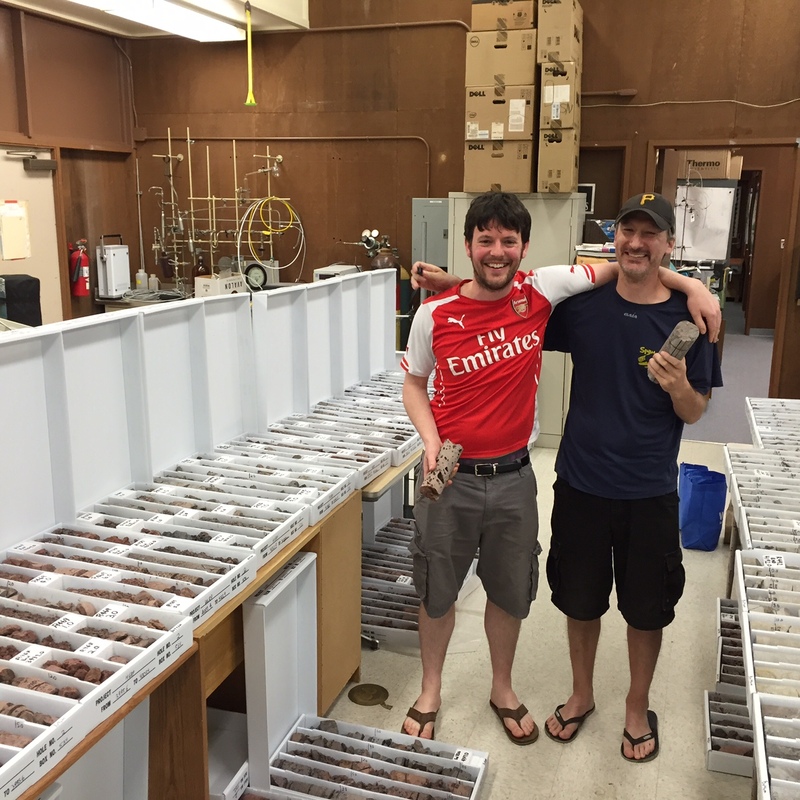 Above, Dr. John Millet and I are pleased with having completed sampling of the rock core from both of the saddle boreholes. John will return to Aberdeen, Scotland and conduct a variety of petrophysical measurements on these samples on behalf of VBPR. As for the downhole geophysical logging, that didn’t go as smoothly. A multitude of drilling-related problems plagued us the entire time that the ICDP–GFZ group was here from Germany, and they were only able to conduct two surveys out of a planned dozen or more. Although this was disappointing, we finally overcome those problems yesterday and are hoping to schedule a return trip for this group in May. Logging of the rocks was on hold while collaborators were in town, but now we’re back at it and we only have ~500′ left before we’re finished with our logging reports for both holes. At that time, I’ll be reviewing and finalizing everything for a while. In another month or so, all the box photos from both holes will be available online, as well as lithologic unit logs for both holes and the logging reports themselves. Last week, we had a preliminary visit from some of the team that will be conducting downhole geophysical surveys in each of the two wells we’ve drilled in the saddle. We discussed some of the logistics of carrying out the surveys, as well as future sampling and research plans. 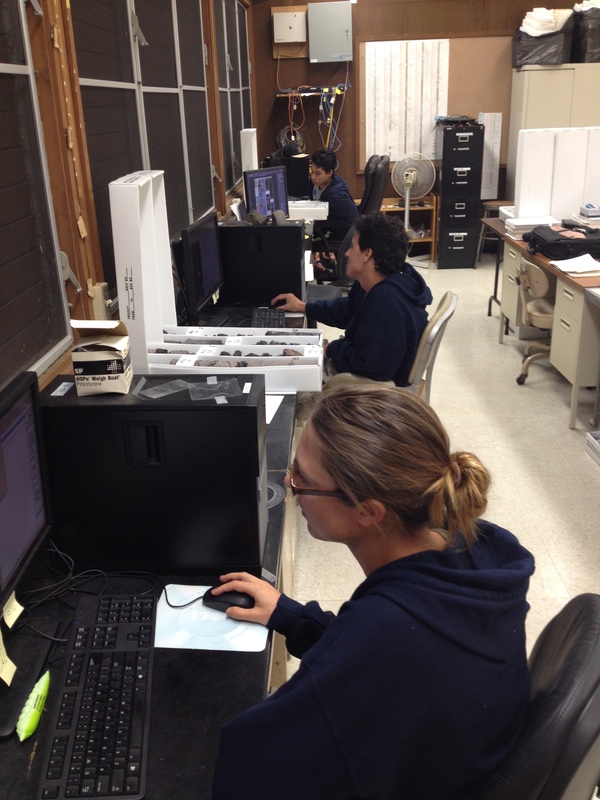 Everyone is excited to conduct the surveys and collect samples for petrophysical analysis early next year. We’d like to thank everyone who visited for their commitment and enthusiasm! Check back soon for a group photo from this visit. 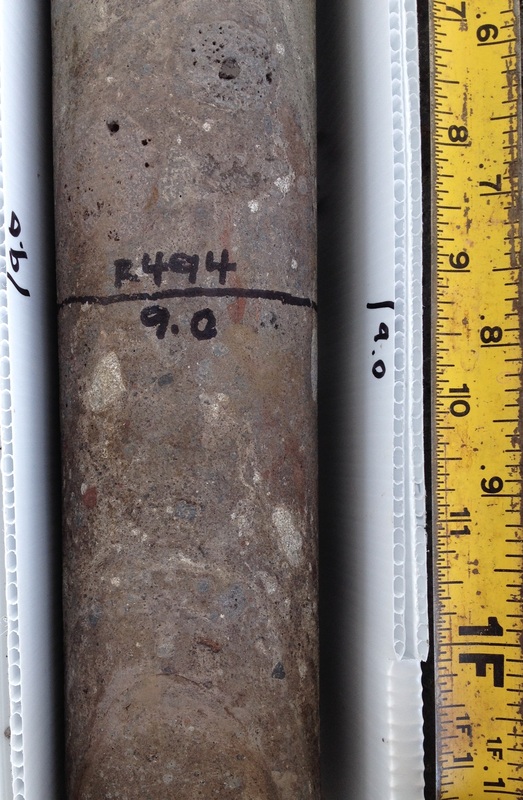 I also want to mention that we’ve been working steadily on the petrographic core logging reports, and we’ve now described the rock down to ~4000′ depth in great detail. Logging has been difficult due to alteration by hydrothermal circulation around this depth in the hole, but we’re definitely in the home stretch now. We expect to have the logging reports finished or nearly so by the time the downhole geophysical surveys take place (tentatively scheduled for February). Roger and Donnie strap a tarp over thousands of feet of stacked drill pipe, so it won’t accumulate rainwater during a break in activity at the site. Yesterday was the last day of drilling for Hole 2 of the project. The end came upon us a little sooner than expected, but drilling conditions just became too treacherous to continue. Although sea level (~5400′) was our target depth, it was an arbitrary goal since this hole has been saturated with groundwater since ~1800′ anyway. 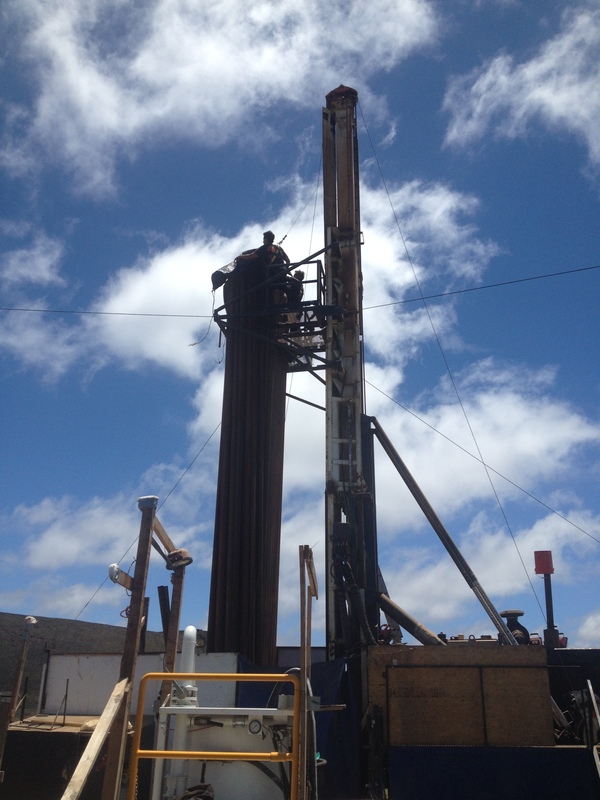 The numerous confined aquifers we encountered during drilling more than proved that there are abundant high-elevation water resources beneath the western part of the Humu‘ula saddle. Stay tuned to this site for more updates as we log the Hole 2 rocks into early next year, and host collaborators who will conduct downhole geophysical surveys tentatively scheduled for February 2016. Liliana uses the wet saw to cut a piece of rock core so it can be placed in the core box without wasting any storage space. 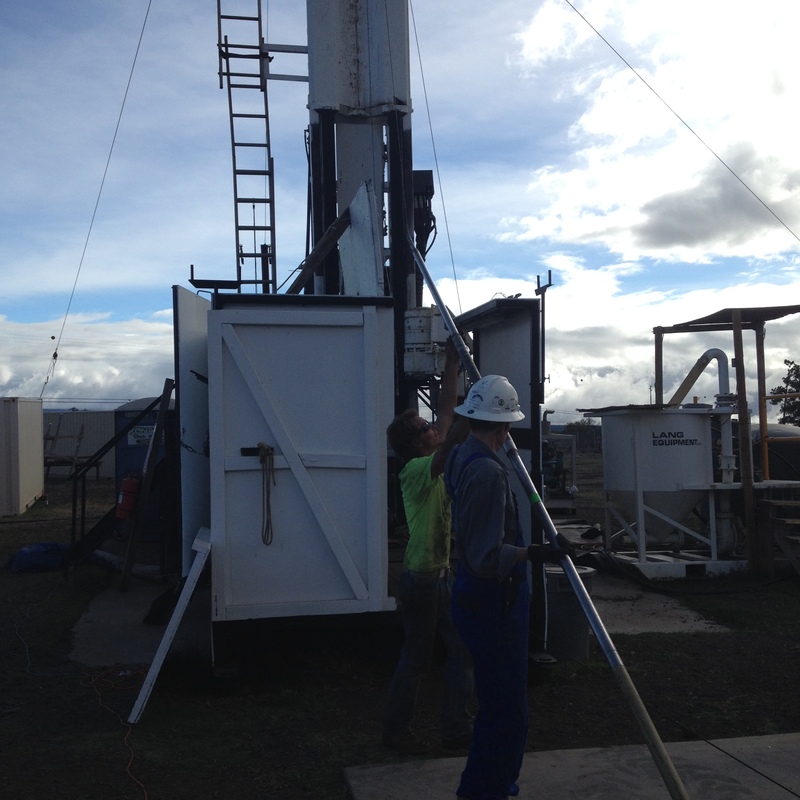 Yesterday they had another solid day and night of drilling, recovering ~80′ for us to process today. Almost all of the rock recovered was pahoehoe, which is rare because this hole has been dominated by ‘a‘a flows. Still, there have been a few days like this where we drill through some extremely thick compound pahoehoe units made up of many individual flows. If drilling continues to go smoothly, we’ll process below the 5000′-mark tomorrow. Apologies for no picture today, but I have good news instead: we had the best day of drilling since the project started back up again! The new drilling strategy of pumping much less mud into the hole because there’s already a large amount of hydrostatic pressure due to groundwater is working out really well. The drillers made ~105′ of downward progress over the past 24 hours. As a result, the core processing team was quite busy today and we processed 97′ to a current depth of 4874′ below the surface. The final goal for this hole is ~5400′, at this rate we’ll reach it soon. 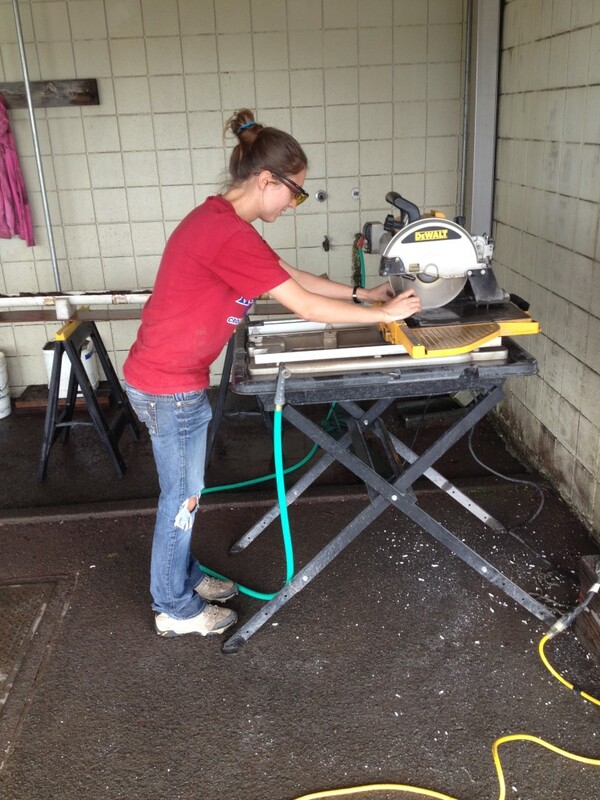 After spending the last day and a half overcoming some drilling obstacles, we’re coring again and making good progress. 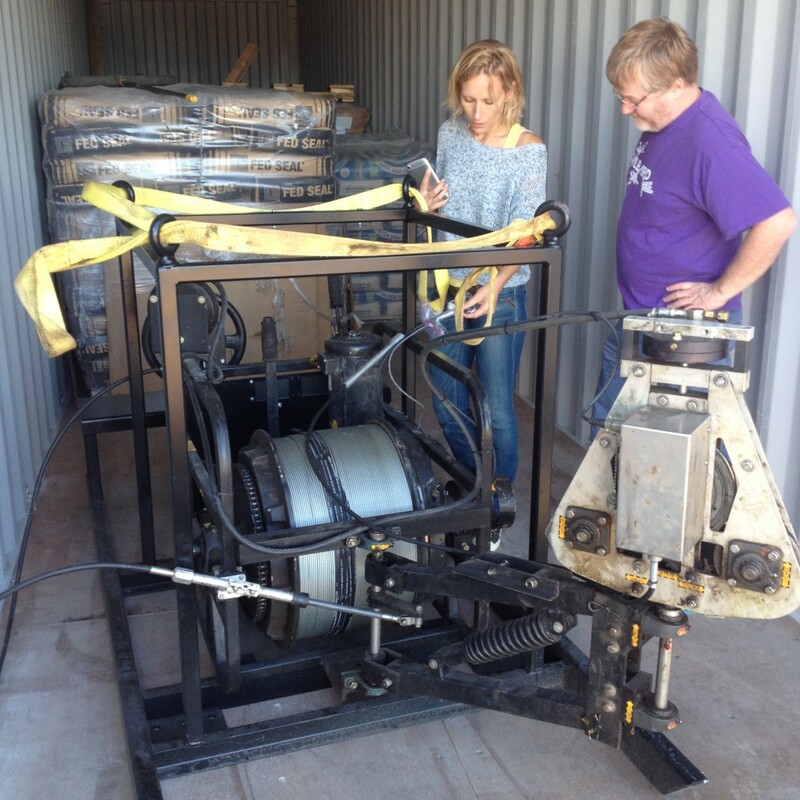 In fact, we just received a delivery of rocks totaling ~40′ – and most of it was drilled this morning. We expect a busy day of core processing tomorrow, the drillers have modified their approach and this alternate technique looks like it may boost our penetration rate. Today the drillers had to trip all the pipe out of the hole. The reason for this was to dislodge some rock that had fallen out of the bottom of the core barrel, which was blocking the next barrel from reaching the bottom. Since the entire drill string had to be brought to the surface, the drillers examined the bit and determined it was time to replace it. Even though it still had a good cutting face, there was significant damage behind the teeth of the bit. In fact, it was probably the poor condition of the bit that led to the problem of some of the core falling out of the barrel in the first place. At the time of this post, the crew is tripping the drill string back into the hole. As for the core processing side of things, we’ve now processed rock to a depth of 4737′. 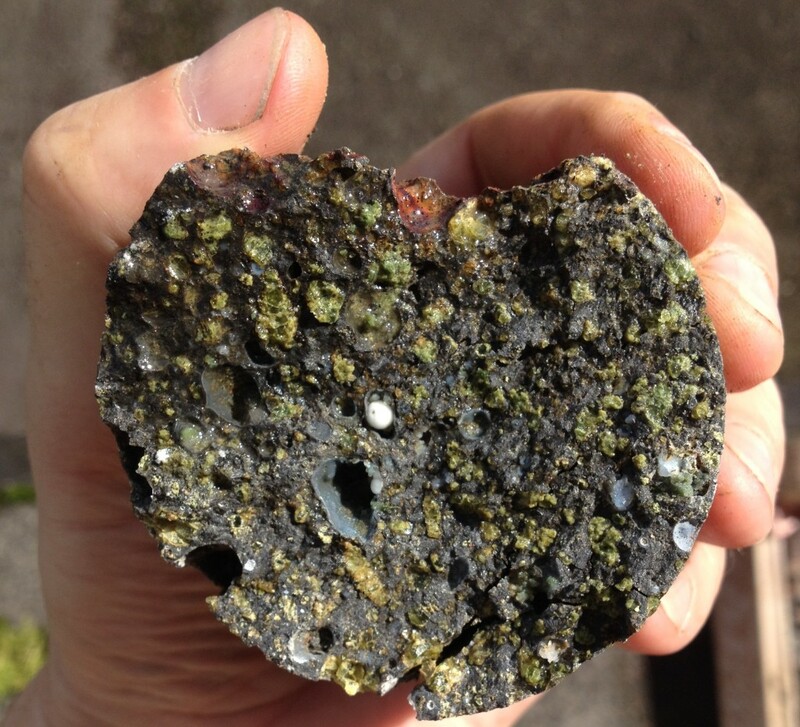 Today’s 46′ of rock was all pahoehoe and ‘a‘a lava flows, the photo above is another view of the olivine-rich intrusion I posted yesterday. Drilling continues to proceed pretty smoothly, we processed another ~70′ today. Among that rock was the first intrusion we’ve seen since drilling started up again. If you examine the photo above, you’ll notice a brown shape with a black outline that sort of looks like a large wave about to break. You’ll also notice a lot of light-colored spots inside the wave shape. This is the top contact of an intrusion: the black outline is its glassy margin and the light spots are olivine phenocrysts (as you can see, it’s extremely olivine-rich). The intrusion closely resembles a shallower one that I posted a picture of on this site back on July 18th, I wouldn’t be surprised if they were both from the same olivine-rich magma source. This particular intrusion is about eight feet thick, and toward its base it completely captured some clinker pieces from the ‘a‘a flow it invaded. I’ll try and get a picture of some of that captured clinker to post another day. Just a quick text update today, drilling is proceeding steadily and we’ve processed core to a depth of 4623′ below the surface. Overall we’ve seen a good mix of pahoehoe, transitional, and ‘a‘a flows. The mineralogy of these units ranges widely, from flows that contain lots of olivine, plagioclase, or both as well as flows without any phenocrysts at all. The most constant feature of the rock we’ve processed over the last two days is most of the fractures are strongly oxidized from water flowing through them. However, despite extensive alteration along fractures, flow interiors are still pretty fresh and suitable for geochemical analysis. Liliana and Lima box and dry runs of core, two of the many steps in our core processing routine that we perform on the rock once it’s delivered. After a lot of obstacles and hard work to overcome them, yesterday the drillers were able to do some core drilling at the depth we left off at back in July. The hole is finally pretty clean of most debris and about as stable as we can hope for. 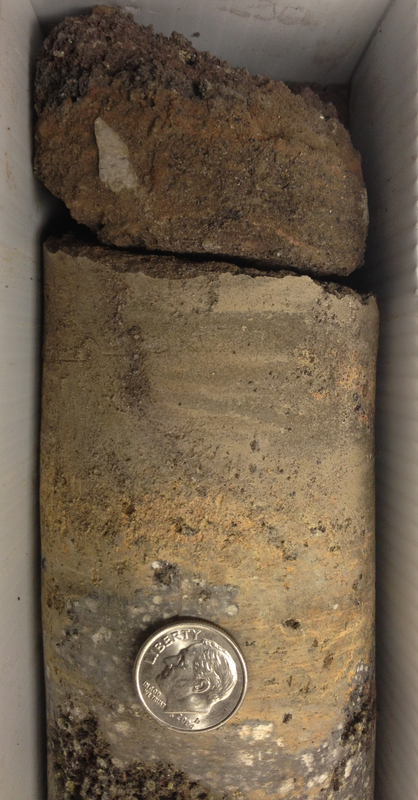 We processed ~70′ of core today (see photo above), to a depth of 4563′ below the surface. Later tonight, we’ll receive what the day shift was able to drill. Our goal for hole completion is to reach ~5400′ depth (sea level), and if everything goes well that will only take a couple more weeks or so. Stay tuned for tomorrow’s update, I’ll be posting updates every day as long as we continue to get rock deliveries from the drillers. The drillers arrived a week ago today, and have been hard at work trying to stabilize the borehole for another ~1000′ of drilling. Unfortunately, water flow in the hole has destabilized the sidewalls at some depths and resulted in our coring bit and shell getting stuck a couple times. We were able to fish these parts out (see photo above), but we have to be extremely careful as we advance downward. At the time of this post we’ve cleared obstructions in the hole at 2000′, and are slowly trying to clean out the hole and reach the bottom at ~4500′. A probable ash deposit in the Hole 2 core. Note the large clast or small bomb in the upper part of the photo, and the small grain size of the ash particles (look along the fracture). Click on photo to view full size. Dime for scale. Time for a long-overdue update on project progress. As you can tell from the title of this post, we’ve continued to steadily log the core from the second hole and have reached a depth of ~2700′ so far. The photo above shows one of the more interesting finds from just above that depth, a probable ash layer from an explosive phase of an eruption. We’ve also sent out some samples to collaborators, are coordinating an exhibit for presentation at UH Manoa this weekend, and have continued to add box photos to the Hole 2 online album. However, the biggest project news is that drilling will start up again next week! The drillers are scheduled to arrive on the 26th and will start working the next day. We could potentially see new core from 4500′ and below by the morning of the 28th. We only need to drill another ~1000′ or so to finish the hole, which is expected to take about two weeks. After that, we will prepare both holes for geophysical surveying that is scheduled to happen in early December. This page will be updated daily again once drilling starts. A large vesicle and the smaller vesicles adjacent to it are coated with a metallic blue material that we have not yet identified. This material was also seen lining other vesicles of the same unit, but no where else. 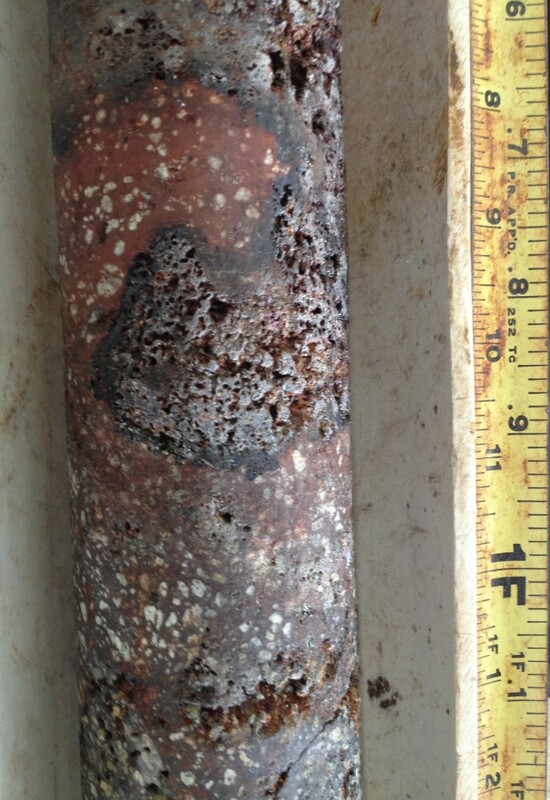 Just one example of many interesting features we’ve spotted while logging the rock of this borehole in great detail. My thumbnail for scale. Although this site hasn’t been updated in a while, rest assured we are hard at work logging the rock recovered so far from this borehole. At the time of this post, we’ve logged to a depth of 1091.3′ and have transitioned to logging HQ-size core (2.5″ diameter, vs. the 3.345″ diameter PQ-size core). We’re certainly seeing a lot of interesting features in the rock (see photo above) now that it’s completely dry and we’re able to examine it more thoroughly and systematically. You can take a look at these rocks too, high-resolution photos of every core box we’ve photographed are available online through this website. Just mouse over our project heading above and click on the subheading HGRP Photos. All of the box photos from the first hole are viewable in their own album, and so far we’ve uploaded through Box 288 (~1700′) from this second hole into a separate album. Enjoy the viewing! 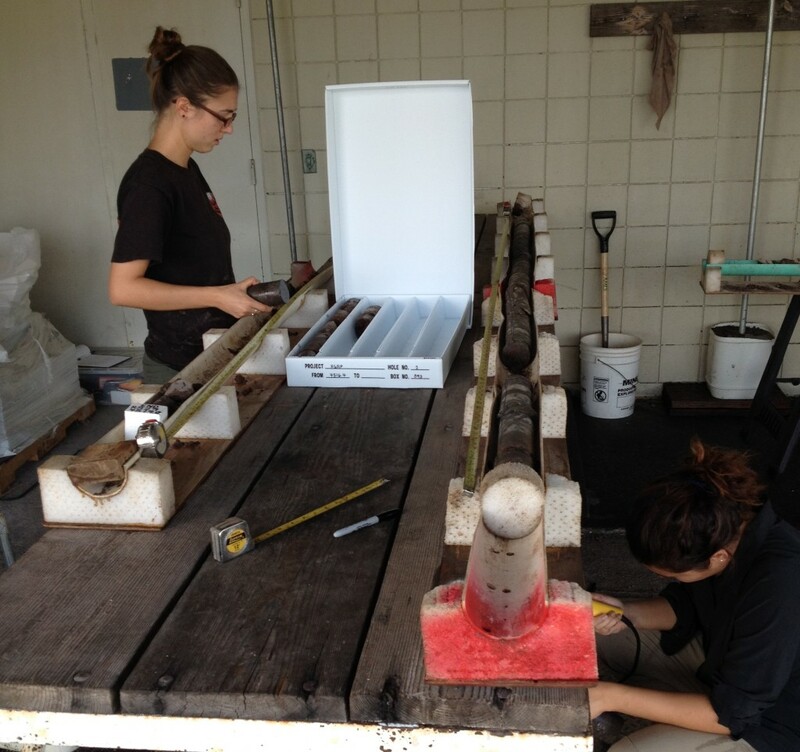 Liliana, Or, and Roger (from near to far) log boxes of core from their workstations in our rock lab. Over the past two weeks, we’ve been getting into the swing of the logging phase of the project. During this phase, we move hundreds of feet of boxed core into our rock lab, take photos of every box, and then describe in great detail all of the features of that rock. We circle and mark features on the photos as we log, so that the final logging reports have annotated images next to text descriptions for every unit sampled by the drilling. As of today, we’ve logged a bit over 500′ down from the surface. We’ve already logged all of the lava and associated units from Mauna Kea’s youngest Laupahoehoe stage, and we’re currently working on the older post-shield Hamakua section. Within this section, we just got word from a collaborator’s XRF analysis that there are at least two high Fe-Ti Hamakua lavas sampled by this recent borehole. These are a known subset of lavas that are relatively rare, so we feel pretty lucky to have sampled two of more of them in our recent drilling efforts. Stay tuned over the next week or two to see how the logging is progressing. 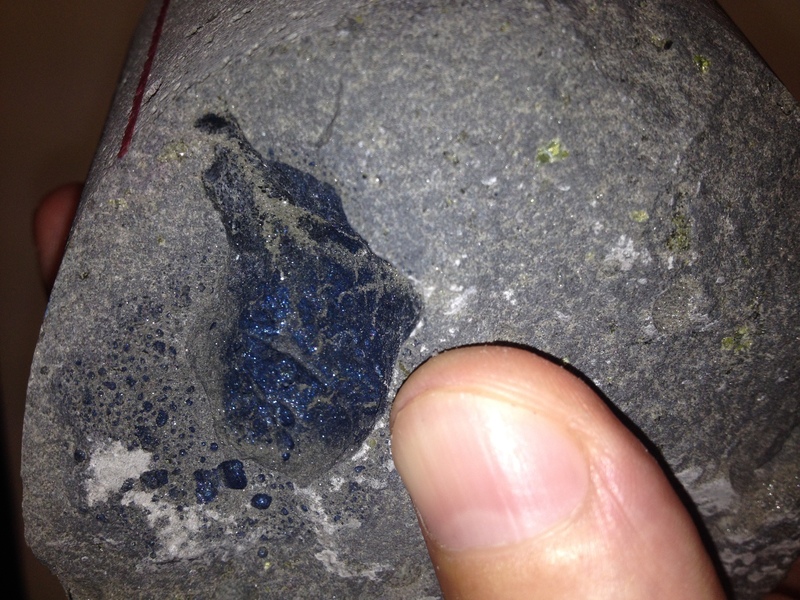 A breccia deposit of angular to subangular clasts in a finer-grained matrix. Note that much of the matrix has been oxidized to a reddish color, probably by heat. This heat may have welded the clasts and matrix together into this solid breccia rock. We’ve been processing a lot of complex core lately, some that we’ll have to do further interpretation of later. In the photo above is one of those units, a breccia that looks welded together by baking. This type of deposit could be landslide debris that was later baked as a lava flow traveled over it, or it could be a pyroclastic flow deposit that welded itself together with its own heat. We saw a couple breccias in the first hole, so eventually a comparison of clast types can be done between the breccias in the two holes ~10 km apart. They could both have been produced by a large event, or could be separate examples of a similar process that produced breccia deposits in the saddle region as the Mauna Kea shield grew. Today we processed core to a depth of 4359′ below the surface. Solid rock core that would normally be made up of loose clasts and finer matrix material has been welded into a breccia by the adjacent dike. Today we processed almost 100′ of core, and it was all pretty solid – at least compared to the rock we’ve been seeing over the past couple weeks. Drilling progressed quickly downward through the subvertical dike last night, and we saw nothing but that dike rock for just over 100′. Over 100′ of drilling in 24 hours is a feat we haven’t seen since much shallower in this hole, and the rock has to hold together well to pull that off at these depths because of how long it takes to reel in the core and send a new barrel down to the bottom in between runs. In the photo above, you can see what the rock looks like just after we drilled through the dike, all the material that would have been a loose mess was welded together to form brecciated rock. Word is that the latest rock drilled is also holding together well, so it’s possible that this dike broke apart much of the loose rock we saw above it and was the cause of that “rock soup” (and maybe the oxidation of much of that rock as well). Stay tuned for updates on how well the rock holds together as we drill deeper. 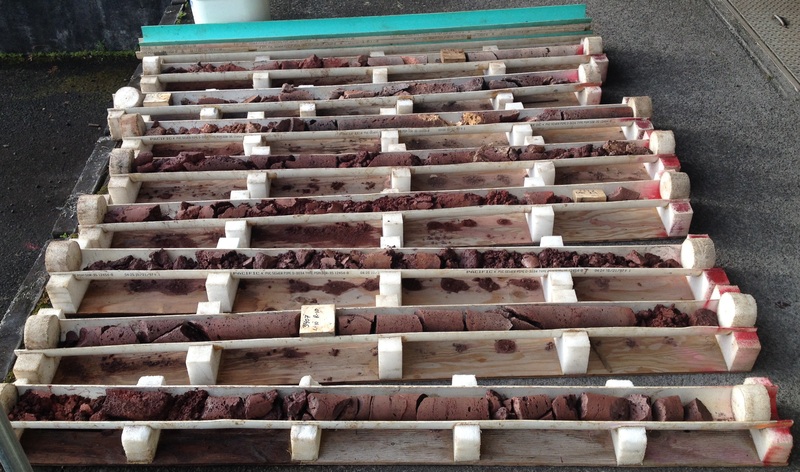 A photo of Box 546, which shows the transition from flow units to a dike unit, with glassy and oxidized chilled margins in the 2nd, 3rd, 4th, and 5th columns. The core is entirely dike rock starting just above the R484-3.0 line. You may want to click on the photo to see it in more detail. Today we processed some interesting and solid rock, we recovered another intrusion! This rock not only welded together the ‘a’a clinker above it, drilling it is much easier because it has very few fractures. The intrusion is an olivine-rich, subvertical dike with internal structures that indicate cooling along its sides (chilled margins) and rapid magma movement through its interior (flow lineations). So far we’ve drilled ~27′ into solid dike rock, stay tuned to see how long drilling downward keeps us within this unit. Core processing ended today at 4126’ below the surface. 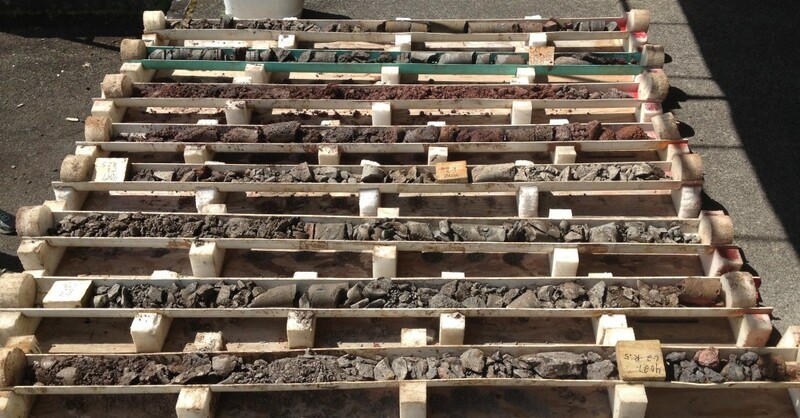 Core trays filled with highly fractured rock and rubble recovered during last night’s drilling shift. 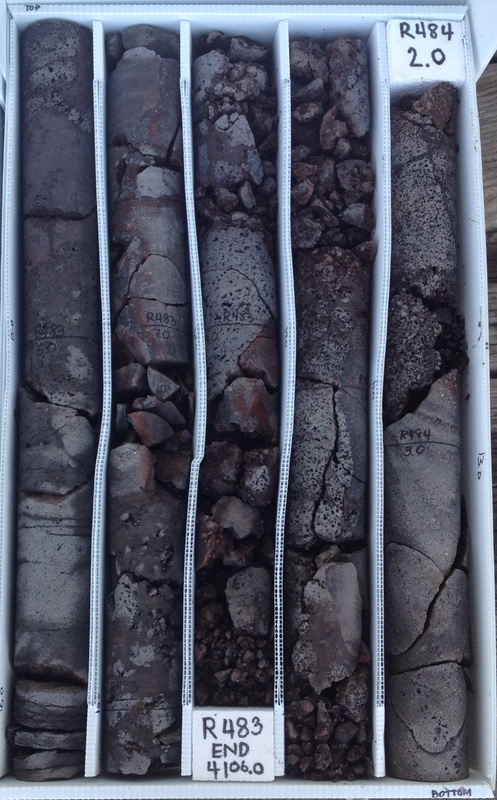 As you can see from this photo, the runs of core we’ve been sampling lately have been made up mostly of highly fractured rock to rubble that can’t be pieced back together. This is the reason our bit gave out a couple days ago, as the broken-up rock tends to eat away at the bit matrix more than solid rock does. Overall drilling and processing of this material goes slowly, but we’ve still managed to keep advancing downward pretty steadily. The deepest rock shown in this picture (far end, top left) is from 4065′ below the surface. Two halves of ‘a’a core that fit together along a vertical fracture and are also horizontally fractured in multiple places. In addition, they both contain a number of rusty red spots of alteration from chemical interaction with groundwater. Although we didn’t get that much rock to process today, tonight’s delivery of core has gotten me guardedly optimistic. The day shift recovered some full-length runs (10′) and nearly full-length runs of core that held together quite well and wasn’t all oxidized. Hopefully this trend will continue, although it’s too early to tell. At the time of this post, drilling has reached 3940′ below the surface. As mentioned in other recent updates, the rocks we’re recovering are still strongly oxidized and highly fractured (and not very photogenic, sorry for the lack of a picture today). We’ve been running the temperature tool down the hole at least once on each of the last few days, and temperatures where we’re drilling now are a cool ~20°C. This means that the hydrothermal circulation that made all this rock so oxidized and red happened long enough ago that it isn’t heating up the groundwater any more. We haven’t done a detailed temperature profile yet, but the warmest portion of the hole seems to be near where we took our first measurement (the one that returned 33°C). This was a few hundred feet above where we are now, around the same depth as the largest intrusive unit we’ve seen in this hole so far. These intrusions are potentially some of the youngest rock we can encounter (thousands to tens of thousands of years old), and rocks are poor conductors of heat, so elevated temperatures near intrusions aren’t particularly surprising. At the time of this post, drilling has reached 3805′ below the surface. Today we processed a lot of highly fractured to rubbly, oxidized pahoehoe. It seems the recent reprieve from oxidized rock was short-lived, some of the runs today were made up entirely of friable rock. I’m hoping that soon the rock will start to hold together better due to compaction and cementation by secondary material, as we saw in the first hole. However, conditions in the two holes have been quite different so I don’t dare make any predictions yet. At the time of this post, drilling has reached 3665′ below the surface. 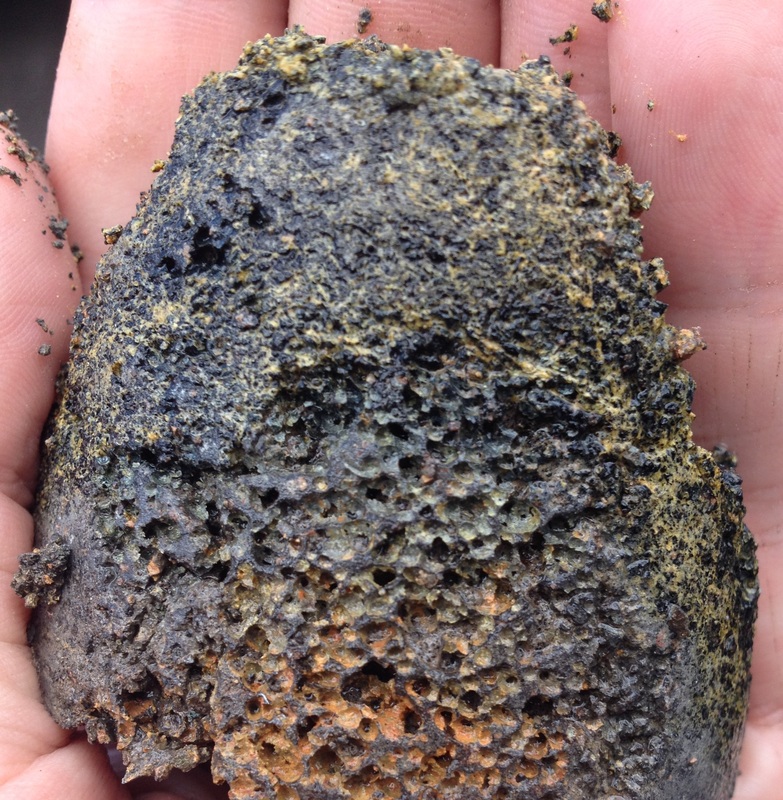 A piece of pahoehoe we processed today with volcanic glass (black) and altered glass (palagonite, yellow in color). Hand for scale, click on the photo to see more detail. Today we processed rock that was less oxidized than the past few days, it looks like we may have drilled through the region of hydrothermal circulation with associated intrusions. The presence of volcanic glass (see photo above) is another indicator of this, as we saw no glass in the strongly oxidized region above. There has also been less glass because pahoehoe flows (which often have multiple chilled margins) aren’t as common as ‘a’a in this hole. At the time of this post, drilling has reached 3540’. Yesterday’s runs of core are laid out on the loading dock, ~40′ of rock and every piece is brown to red from oxidation. 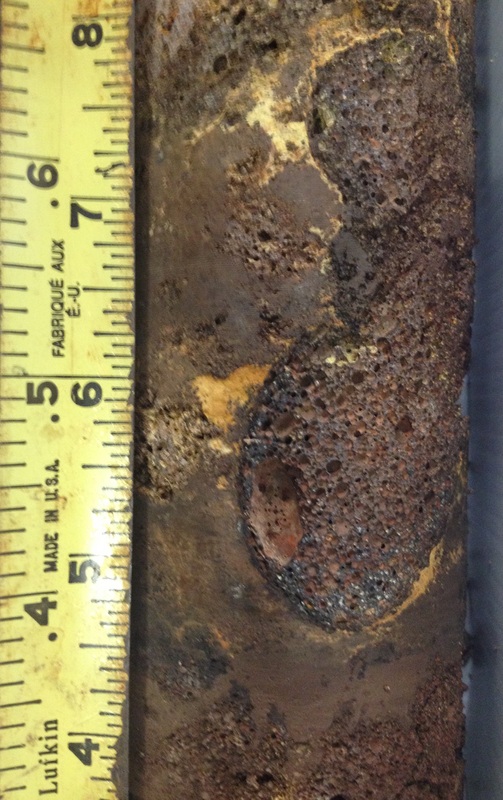 We’re pretty sure this oxidation is the result of hydrothermal (warm to hot water) circulation that was probably strongest thousands or tens of thousands of years ago. Today we processed ~40′ of rock, all of it oxidized (see photo). The drillers had some issues last night and today, so we don’t have much new rock at all tonight. I suspect the oxidized rock down at the bottom of the hole is weak and highly fractured, so that could be the cause of some of the drilling troubles. I don’t have much more info to report right now, stay tuned for more details in tomorrow’s update. Another arm of the same intrusive unit shown in yesterday’s photo. Note the orange-brown rubble above and below this intrusion, and that the arm is only about half a foot thick. Today almost all the rock we processed was strongly oxidized again. This is more than just baking of the top of one lava flow when a new one is emplaced on top of it, this extent of baking is caused either directly or indirectly by a long-term source of heat in the area. Although I’ve been posting pictures of intrusions, we actually haven’t seen all that much intrusive rock; certainly not enough to cause all the baking/oxidation we’ve seen over the last few days. My guess is that there is or was enough heat in the hole to cause hydrothermal alteration of much of this rock. We know there’s plenty of groundwater below 1800′ or so, and when that water is heated it circulates through fractures in the rock and oxidizes it more quickly than cold water can. Soon we’ll send the temperature tool down the hole and determine whether all this oxidation happened long in the past and the heat source has cooled, or if there is significant heat in the hole from a still-cooling magma body nearby. As of the time of this post, drilling has reached 3415′ below the surface.